Drawing on Queen Victoria’s diaries, which she first started reading when she was a student at Cambridge University, Daisy Goodwin—creator and writer of the new PBS Masterpiece drama Victoria and author of the bestselling novels The American Heiress and The Fortune Hunter—brings the young nineteenth-century monarch, who would go on to reign for 63 years, richly to life in this magnificent novel. "An intimate portrait of an extremely bright but painfully lonely teenage girl who one day had only pets and dolls for company and the next was regent of England." "[An] irresistible love story…Fans of Downton, The Crown, etc., will want to dive right in." "Irresistible...[A] rich and passionate historical novel." "Fans of character-driven storylines will relish witnessing Victoria's transition from immaturity to adulthood." –Real Simple,"Best New Books to Read This Month: November"
"Fun, romantic, and suited for both adult and teenage readers." "Goodwin demonstrates her admirable ability to fuse wide-ranging knowledge of the period with lively storytelling skills." "Highly recommended...Bestselling Goodwin always draws in fans." 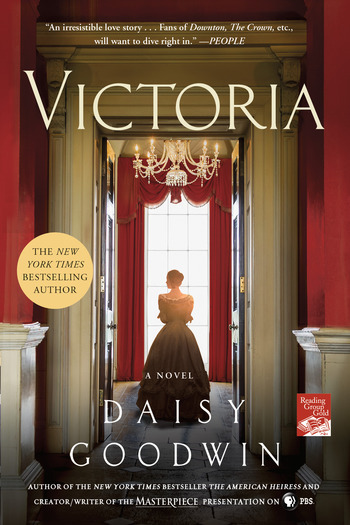 "[Victoria] will sweep you away. It sumptuously brings to life the tale of Victoria's ascension to the throne, her battles with her mother and her relationship with her Prime Minister, Lord Melbourne. I loved the detail in this novel, and tore through it." "A shrewd, spirited historical romance with flavors of Edith Wharton, Daphne du Maurier, Jane Austen,Upstairs, Downstairs, and a dash of People magazine...Superior entertainment." "Gorgeous...the perfect storm of escapism, suspense, romance, and superb historical research." "A luxurious indulgence...Goodwin writes with effortless grace, and her dialogue's subtle wit is delightful." DAISY GOODWIN is the author of the New York Times bestselling novels The American Heiress and The Fortune Hunter. She is a Harkness Scholar who attended Columbia University's film school after earning a degree in history at Cambridge University, and was Chair of the judging panel of the 2010 Orange Prize for Fiction. The creator and screenwriter of the Masterpiece presentation Victoria on PBS, she lives in London.